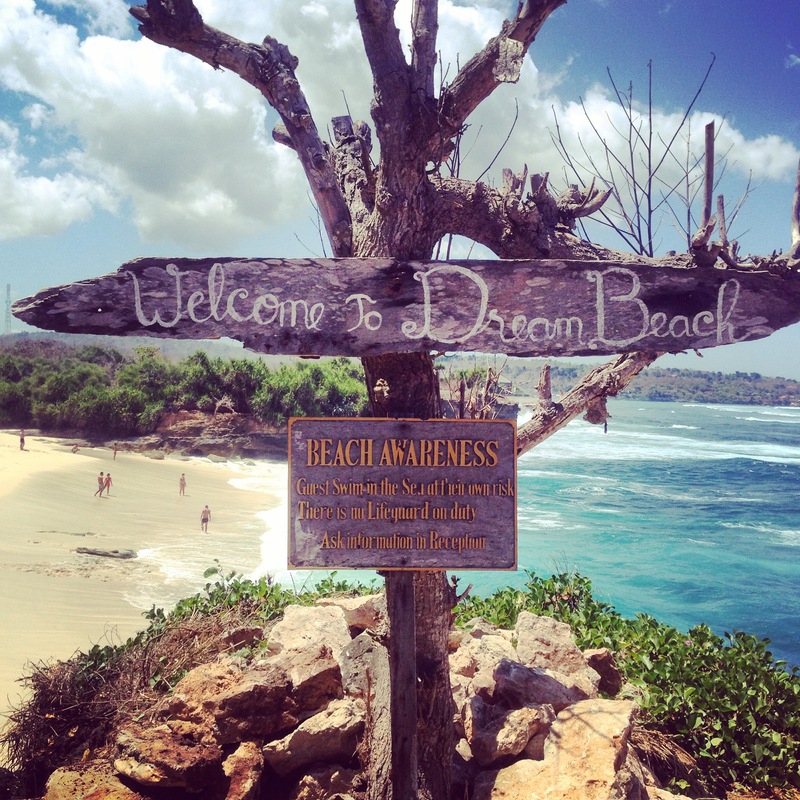 Nusa Lembongan: Mini Colombia sounds mischievous but, when we drove in an open safari car through the small bending hilly dirt roads, we passed large leafs of banana trees and small wooden cabinets hidden behind the jungle. We suddenly got this strange feeling that we took a wrong turn somewhere and ended up in Colombia. It wouldn’t be that different as our local friend told us there was no police in Nusa and the Mary-J was friend to many. Which apparently was also the case in Gili Air as the insides of the wallets of locals reminded me of local wallets from Amsterdam, if you get my drift. We noticed many Mexican restaurants, serving tacos, wraps and nachos on the menu. Where did this influence come from? Also, we saw a lot of Chinese people staying in large all inclusive resorts and hotels on the island near the beach on the left. These resorts have small floating waterpark attractions on the coastline which I personally found horrible for the view and made Nusa feel a little bit like a Disneyland tourist attraction, Ugh. The restaurants on the coast a bit further away from this, have great view but I would recommend to only have drinks there, as the food isn’t that dazzling. Nusa Lembongan is connected with it’s little sister island Nusa Ceningan by a small scrappy wooden bridge that can be crossed with scooters or walking. We wanted to stay a few days here but ended up staying a week because there were so many nice things to do plus our hotel was amazing! 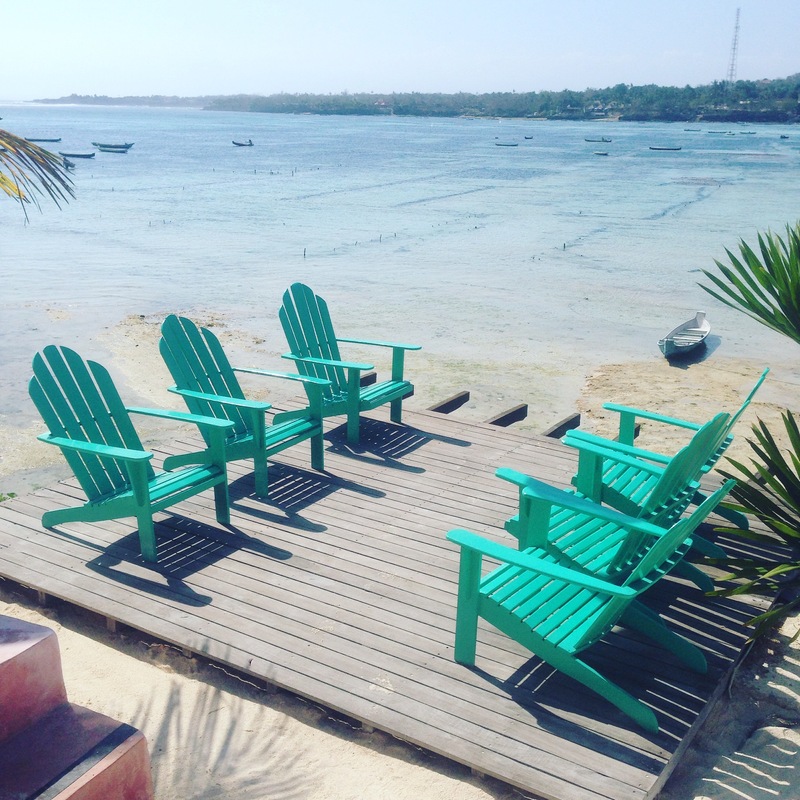 Nusa Lembongan is a great island to relax on and will give you the feeling of coming down to earth. But remember: bring cash because there’s NO atm on the island! 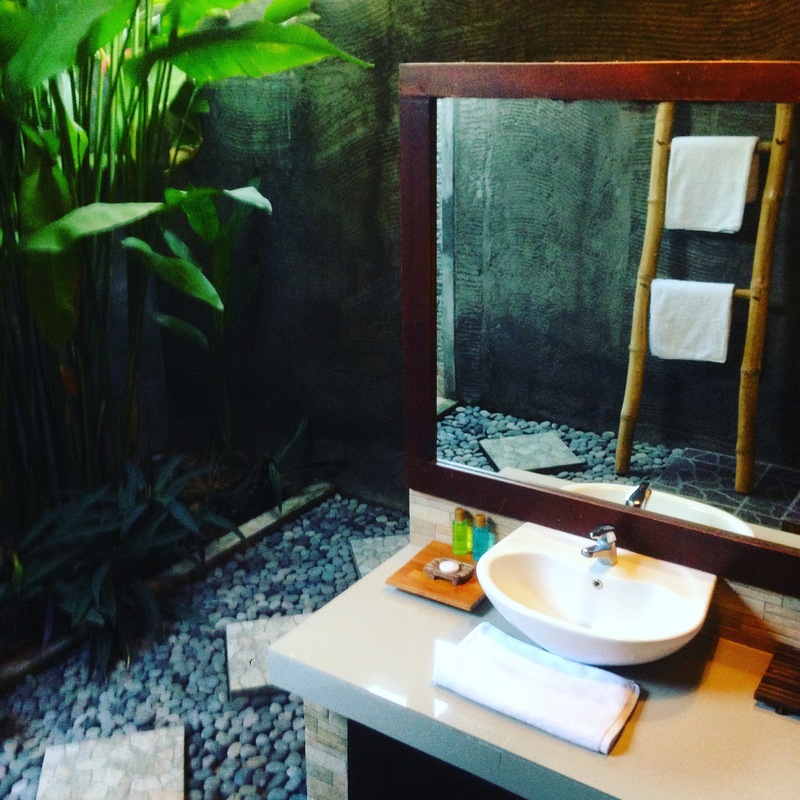 Darsan Lembongan Boutique Cottage: To start off, our stay on Nusa Lembongan wouldn’t have been the same if we hadn’t slept in this awesome chilled out hotel! The owner GeDe welcomed us with open arms and started off explaining the island, which was nice to hear from a local. Then he led us to our home away from home, a true paradise compared to the hotels that we’ve experienced! Small wooden cabins surrounded a beautiful infinity pool and well kept garden. The cabins were very clean, modern, styled, functional and very chilled out. The bathroom was I think the highlight! 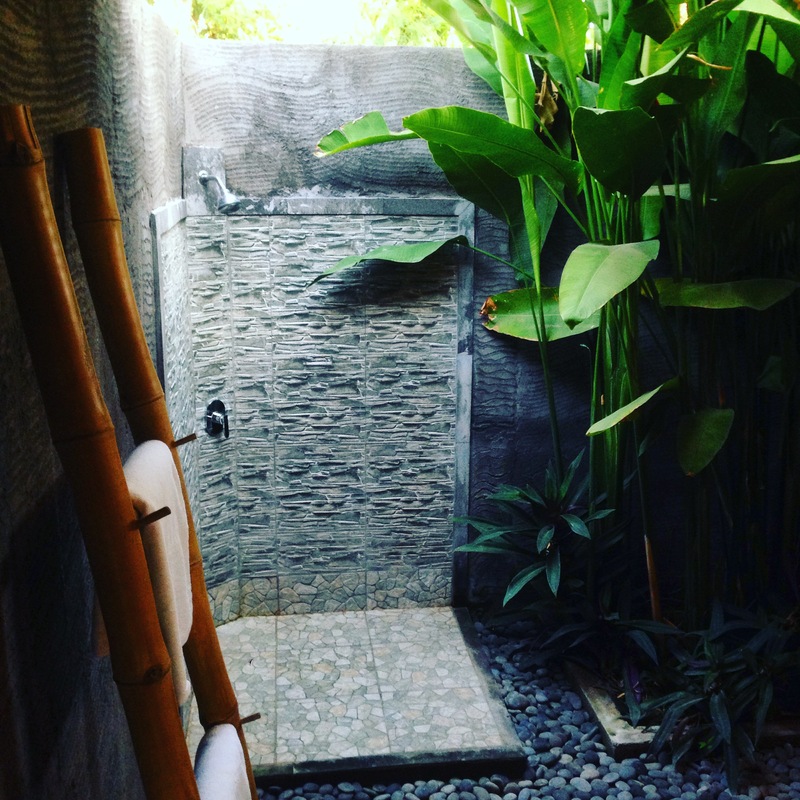 It was outside and covered with small pebbles and stones surrounding the modern styled tiles, sink and shower. While showering you felt the warm sun hit your skin and to the left you found wild tropical plants growing and swaying in the breeze. We immediately booked extra nights and ended up staying a week (37 euro per day is a bizar price for this kind of place). 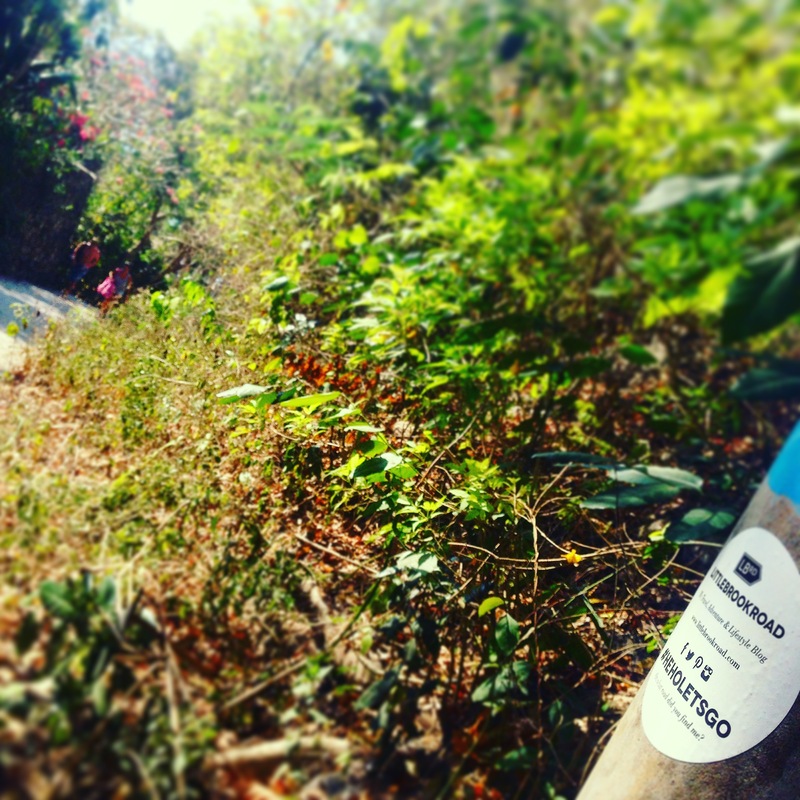 Located 4 minutes from the beach through a small jungle path the hotel is found up on a hill and within 10 minutes with a scooter you’re down on a main shopping road. This hotel was heaven! You really felt at ease here and welcome. During our first hours, GeDe had taken a jackfruit from the garden and waved me over (as I was googly eyeing the strange yet interesting looking fruit from afar) to come take a look and even taste the delicious fruit. It was a combination of mango and bubblicious bubblegum. Each piece of fruit had a huge seed in it and the outer shell is used to feed the cows, as it’s too hard to eat for us. GeDe had worked 13 years at Club Med before starting his own hotel and you can tell he has experience. Through our hotel and GeDe we rented scooters (75,000 Rupiah including Petrol), went snorkeling for 3,5 hours on a private boat (500 Rupiah in total for 2 people) and booked our boat tickets to Sanur with pickup service (250,000 Rupiah pp). All the activities were a VERY reasonably priced and made doing things a lot easier than finding things out yourself. Must Do 1 Snorkeling: This is a must when on Nusa Lembongan. We arranged a private boat through our hotel which was 500 Rupiah for 2 people for 3,5 hours and we got to visit the best spots as the boat owner knew where the coral reef, tropical fish and manta rays were found. 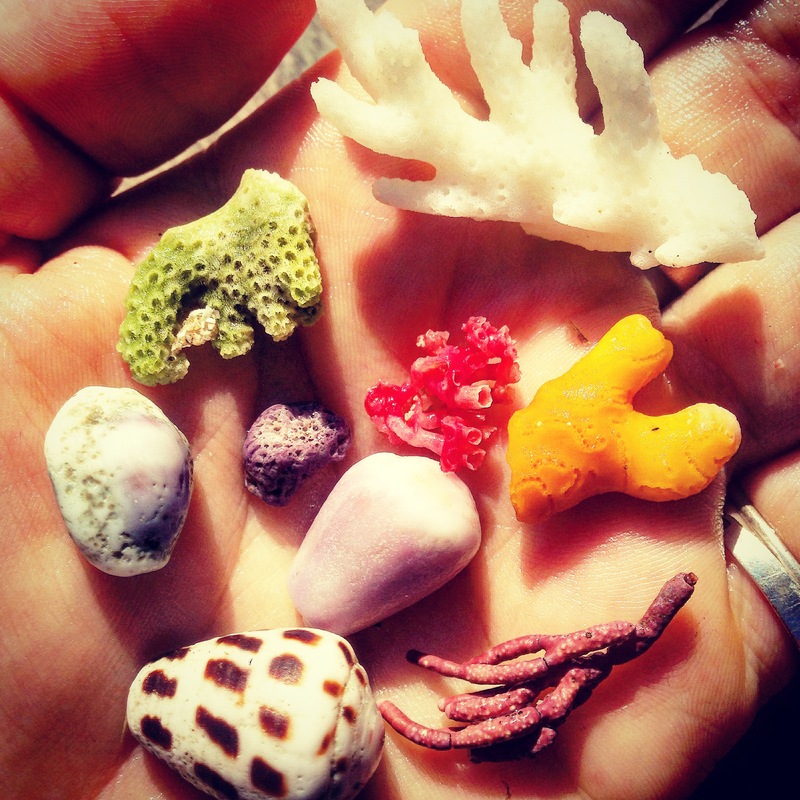 We went to 3 spots: Manta Point, Crystal Bay and Mangrove Point. On Manta Point found on Nusa Penida, we spotted our first ever manta ray and even saw two. 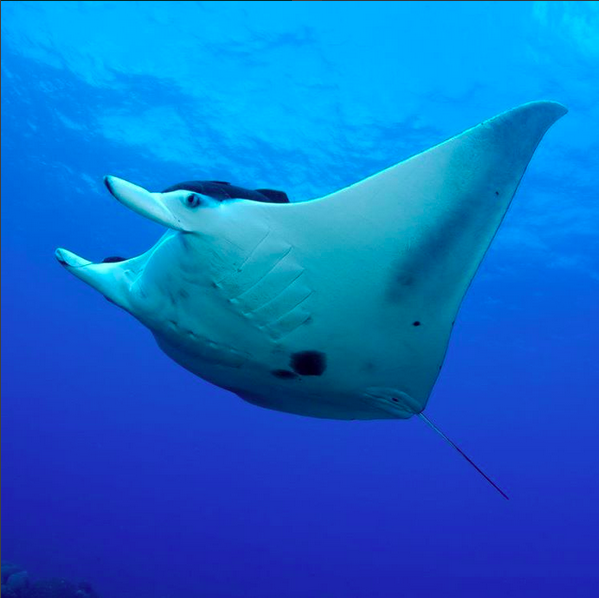 This picture of the Manta was taken by another person snorkeling with us that morning. They were incredibly huge and very peaceful while gliding through the water scooping up small jellyfish. We had already noticed these little guys as we felt small little stings during our stair at these big creatures probably almost 2 meters wide. The deep sad truth is that while you’re reading this post there is a chance that the opportunity to see these beauty’s has passed. The local fisherman that was escorting us explained that he’s seen an enormous decline in Manta’s due to hunting for the Chinese medicine industry. It’s a huge problem and there’s actually an amazing movie that explains this called Racing Extinction, absolutely a must see for nature lovers! We actually only now realise how special it was to swim with these guys. Crystal Bay wasn’t personally a must but we did spot a group of dolphins swimming near this area which was incredible as you rarely spot these guys. Actually to make the situation even more bizar, is that 2 seconds before we spotted them my boyfriend said: “The only thing that would make today complete is if we spotted dolphins”. Who said miracles can’t happen!? Mangrove Point was beautiful because not only was a huge forest growing in the sea, the area around the forest was covered in brightly colored coral and fish that were definitely cast for Finding Nemo. Our captain threw some old bread in the water and the fish went mad! But, we not only did we spot friendly fish we also discovered the electric eel. By the way, if you can dive definitely go out in the waters to find the huge mega big Mola Mola fish, really funny looking thing found in the depths of the waters. 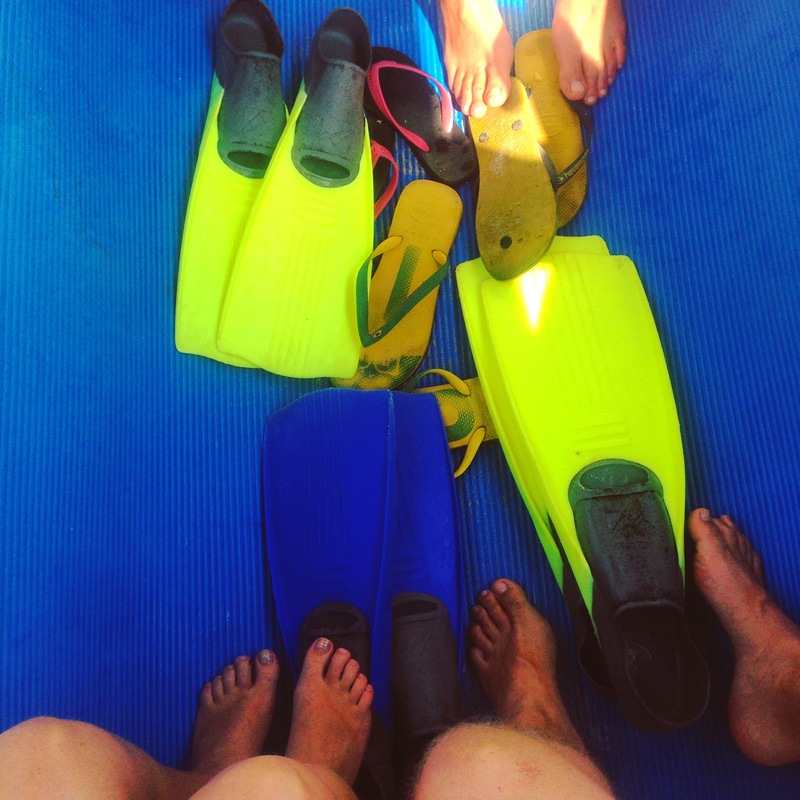 Surfing (lessons): our first ever try-out in concurring the waves of Lembongan. 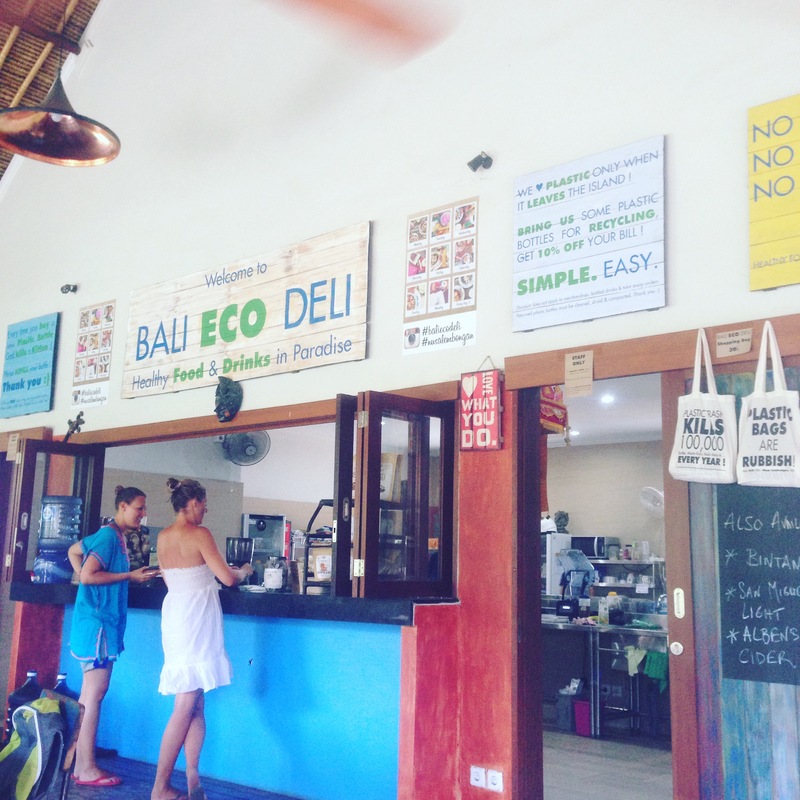 Our hotel, Darsan Lembongan Boutique Cottage, was located near a hidden little jungle path that led straight to Song Lambung Beach on which we discovered a small surf hut called ‘Surf Lesson’, at which you could rent gear or take lessons from a pro. We did the second as we’ve never surfed before and it was worth the while. We payed 300 Rupiah pp for 3 hours surf lessons, gear and a boat to get to the best waves on the water. The guys really knew what they were doing and could easily predict when good waves were rolling in. My boyfriend and I were eventually after 37 try outs very proud owners of a 5 second stand on the board each, woop woop! 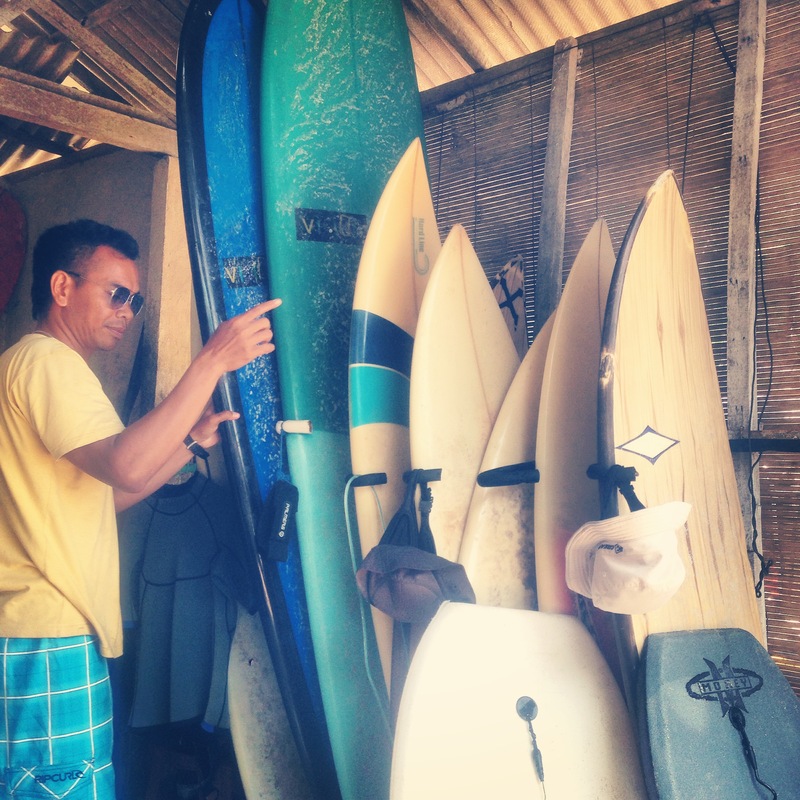 The telephone number of ‘Surf Lesson’ is 081-338-516-762 and their email is mankwilembongan@yahoo.com . 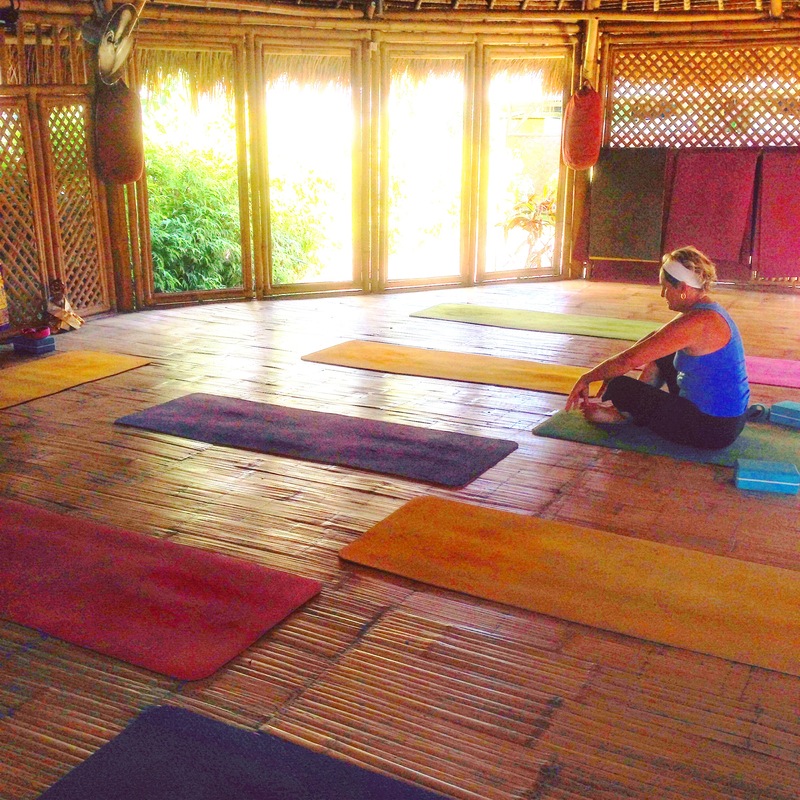 Yoga: Go to the Yoga Shack located on Jungut Batu Main Road and just walk 5 minutes before a lesson starts into the hut. 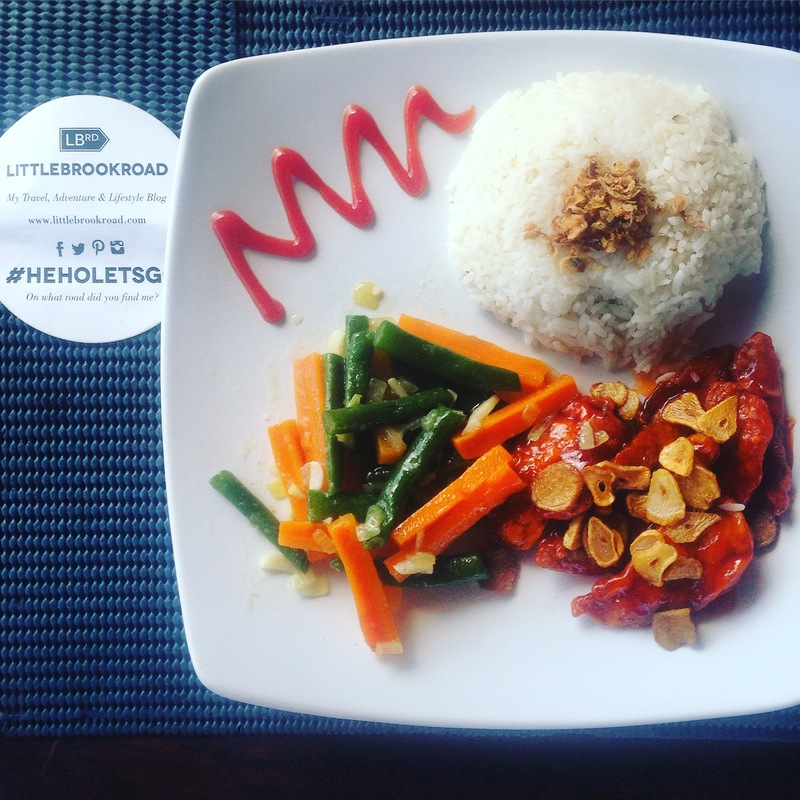 A 1,5 hour lesson costs 100,000 Rupiah and is definetly worth it. I came out all zenny and relaxed after a Hatha session. Check out the rooster to find out which lesson you want to take. I’d recommend going either early in the morning or later in the evening, just so you don’t burn up and shrivel into a prune while enduring the heat. Warung Putu: We discovered this one through TripAdvisor, because we were starting to get really desperate. The first few nights we thought let’s go with the flow and see what we find along the road. But the coastline, which we picked for the first nights, only dealt out empty hands. That’s why we reached out to the wonderful amazing thing called the World Wide Web and found Warung Putu as tip. My tip: order the Pork Bites as a starter (30,000 Rupiah) and then the Caramelized Chicken as main (45,000 Rupiah). Their hospitality is great and they’re very friendly, if you drop by the next day they’ll remember you! Bali Eco Deli: Oh My lordy Lord, Meine Guhte this was yummy in the tummy and it sure was rumbling. The taste of their food reminded me of the States where we had Trader Joe’s Grocery Store that had these oatmeal cookies and organic food that tasted just like this! 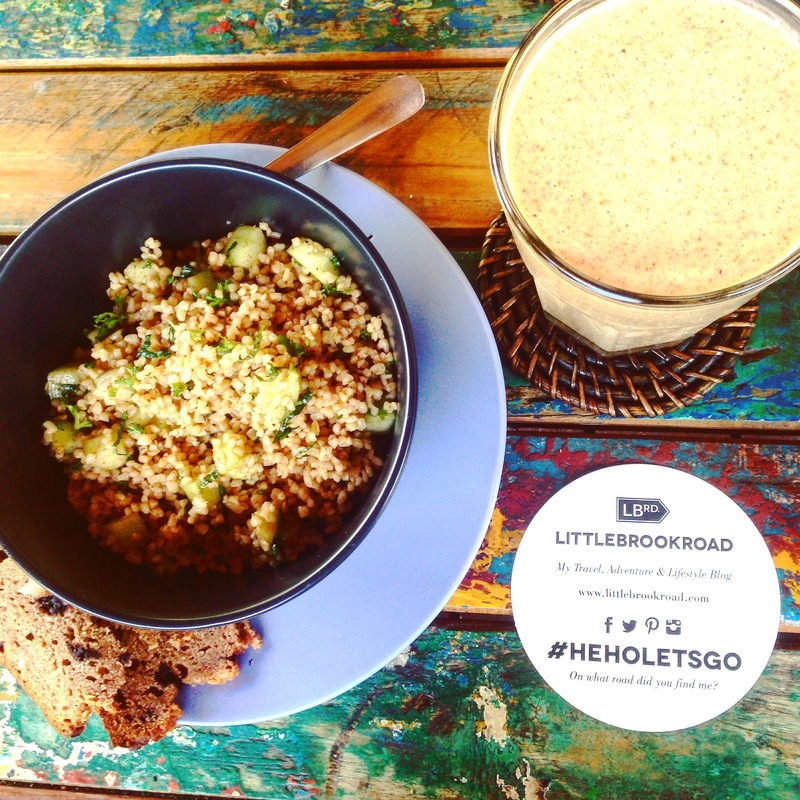 We ordered the Morning Dates Packed Smoothie (34,000 Rupiah) and the Bulgur Tabbouleh Salad (43,000 Rupiah) together with a Soya Cappuccino… yup they had Soya milk woop woop (don’t remember the price here). The toko is focused on organic, ecological, sustainable food and interior. If you bring some plastic bottles in for recycling they’ll give you a 10% discount. Why, if that’s not a smart sales tactic I wouldn’t know. Le Pirate: I have to say, it was a bit niveau riche and we ended up sitting next to a group of girls chatting and gossiping about their PR department that was mingling and dating with their other colleagues from the marketing department and ‘oh my god that’s like so horrible’. Afterwards a discussion arose about European designer clothes and body fat. It couldn’t have been any clichér than that. But aside of the people, the scene was nice: small white and turquoise wooden cabinets combined with pink accents and an infinity pool looking out over the Seaweed farm. But this did make it a bit awkward, the people down in the seaweed farm were working REALLY hard in the blazing sun, which made relaxing at the pool feel a bit shameful. The prices were a lot higher (35,000 for a small Bintang aka beer) but the music filled the place up with a sense of chillness and relaxation. The Deck: Another tourist hotspot, but with a view that makes anything look good and taste yummy. 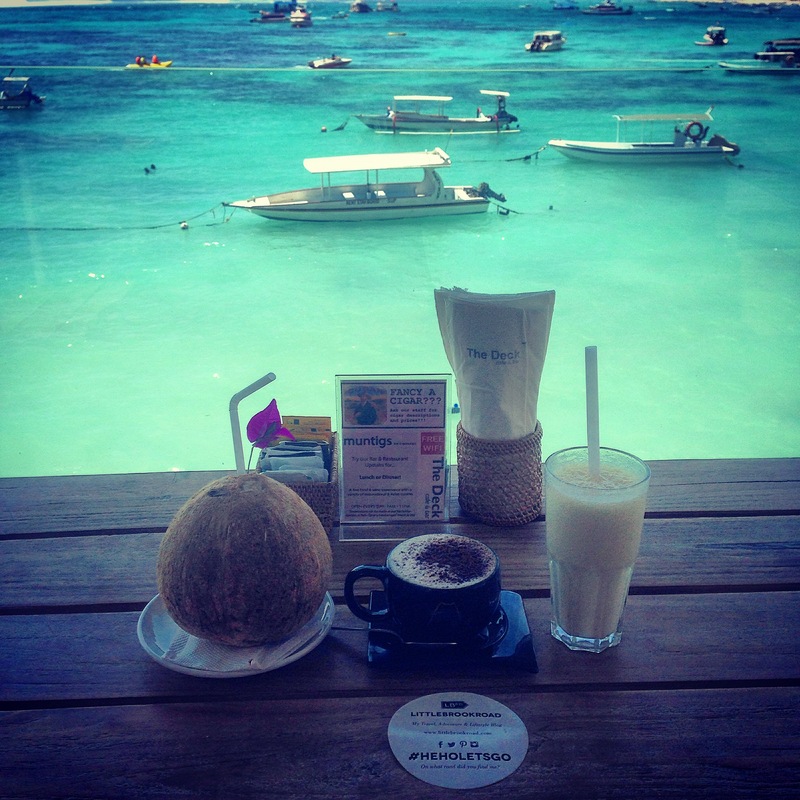 I’d go for a soya cappuccino here together with a fresh coconut and banana shake. 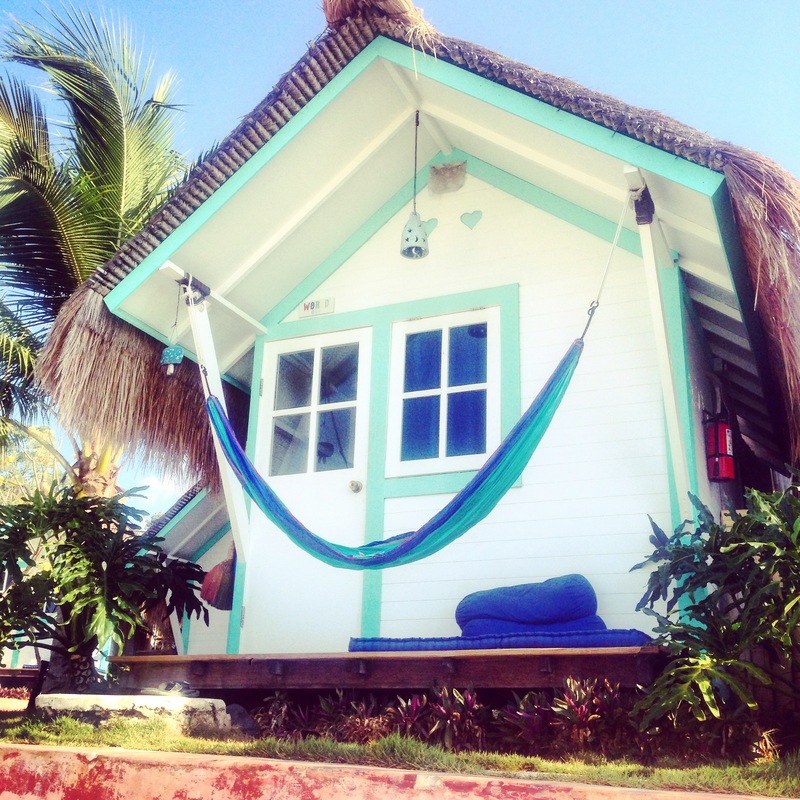 It’s a good start of the day and place to take our your map and decide what to do first: snorkeling or surf lessons? Two Towers: A true cup o’ joe can only be found here! Enjoy it together with a yummy delicious piece of heavenly goodness like a home made brownie or piece of pie to spice up your life (yup a Spice Girls reference here). But seriously the coffee is great and the prices are really good! 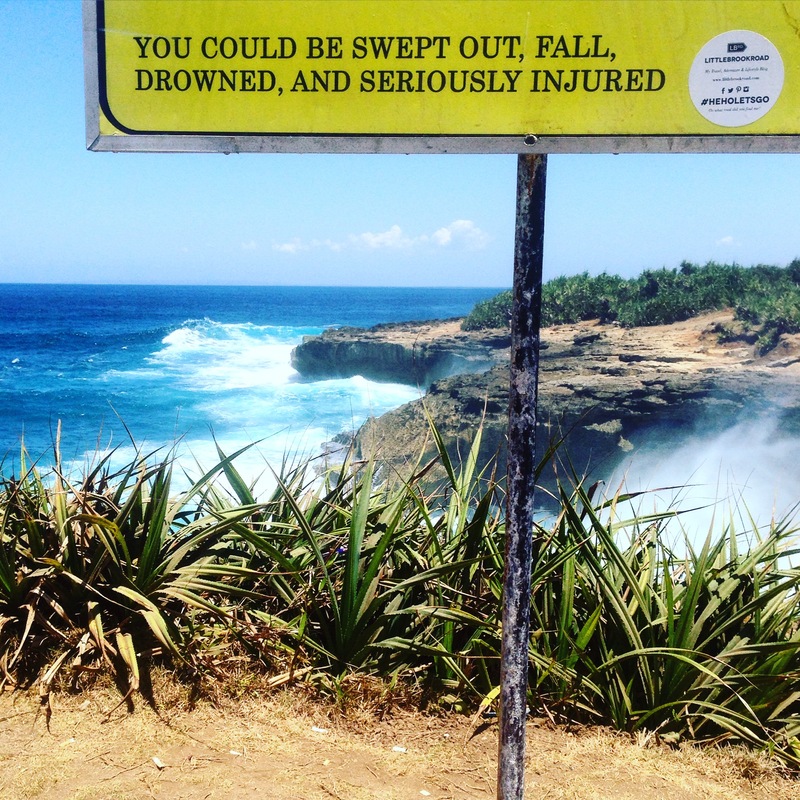 Pay 10,000 rupiah for a large bottle of water for instance. Like the name says it, find them inbetween the two towers located on the hill. Mangrove Forest: The nature and animals on this island are very interesting if you just look close enough. 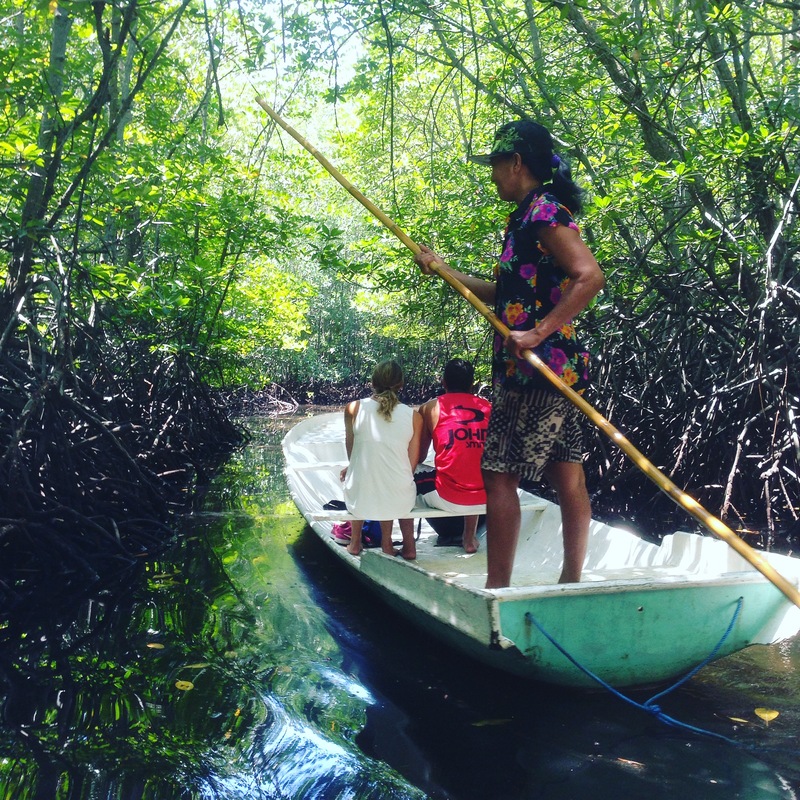 For instance take a boat ride with a local through the Mangrove forest and fall into an inner state of stillness. “There are about 80 different species of mangrove trees. All of these trees grow in areas with low-oxygen soil, where slow-moving waters allow fine sediments to accumulate. Mangrove forests only grow at tropical and subtropical latitudes near the equator because they cannot withstand freezing temperatures. Many mangrove forests can be recognized by their dense tangle of prop roots that make the trees appear to be standing on stilts above the water. This tangle of roots allows the trees to handle the daily rise and fall of tides, which means that most mangroves get flooded at least twice per day. The roots also slow the movement of tidal waters, causing sediments to settle out of the water and build up the muddy bottom. The only thing I really missed was a specialist that could tell us more during the boat ride. Seaweed farm: Seaweed is an important export product for Nusa Lembongan and can be found on the right side of the island near the suspension bridge connecting Lembongan to Ceningan. The seaweed is exported to China and Thailand and is mainly then used for cosmetics and as a binding substance in Ice Cream. 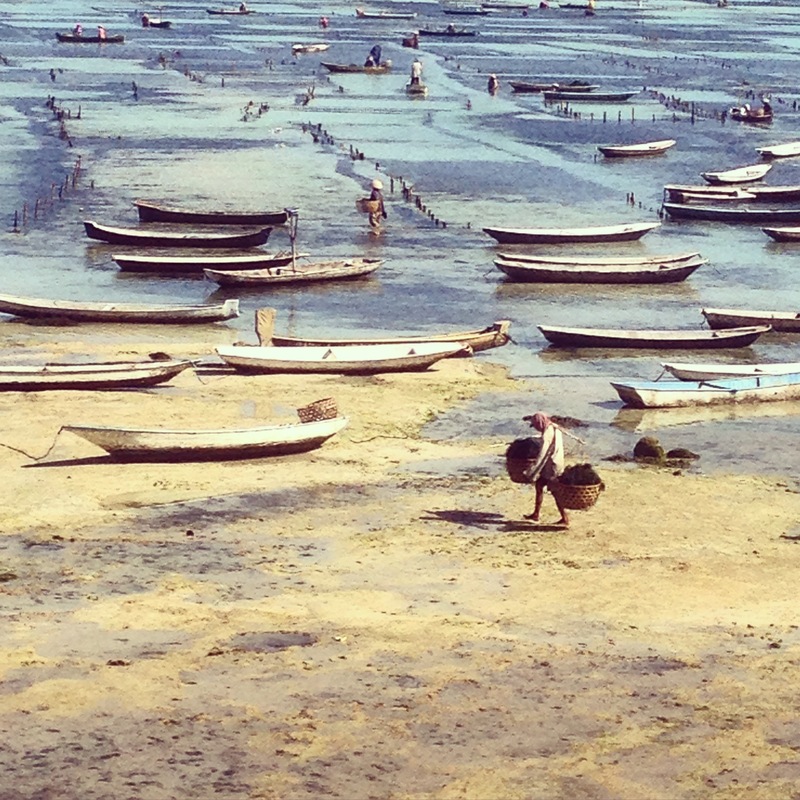 So next time you order a scoop of your favorite flavor, know that Lembongan’s seaweed might be found. Snail crab that can be found on the beach at night. The locals use it as bate for catching other crabs and fish. 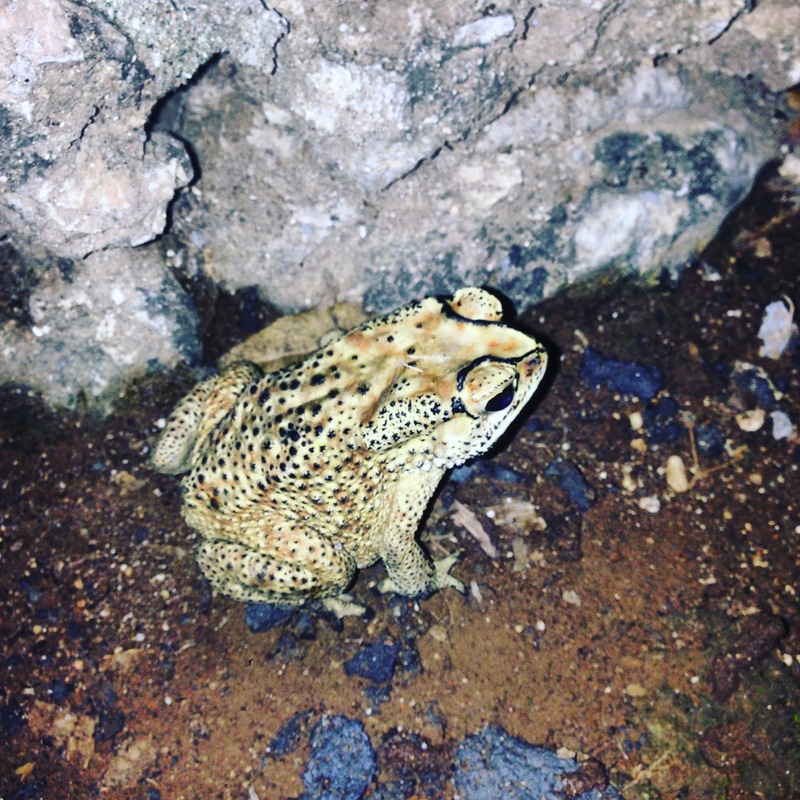 The fatty frog that can be found only at night or sometimes during the day squashed on the road. 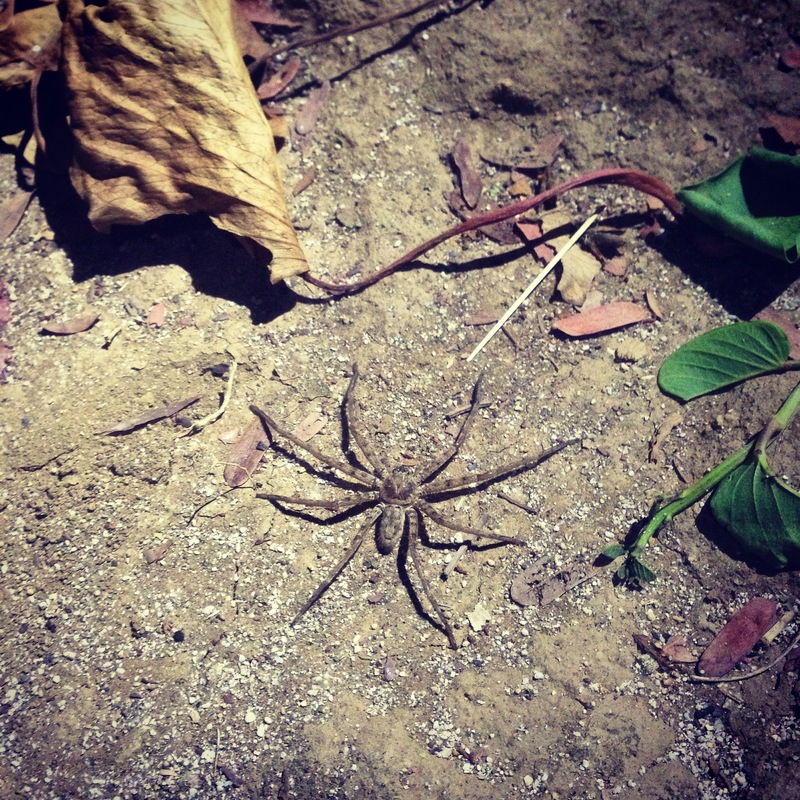 The itsy bitsy..wait.. huge spiders with their pearly eyes that light up when using and LED lamp down a dark road. 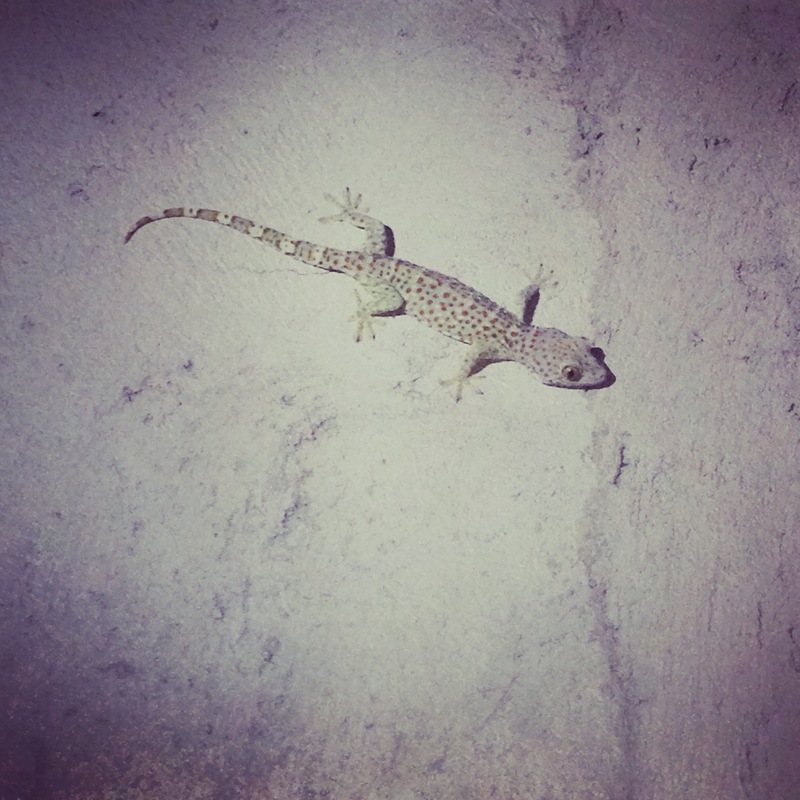 The white Gekko plastered on the wall near a lamp only to be found at night. Dream Beach & Devils Tears: The names of these places give you the idea that they are opposite of each other but on the contrary as both have hideous, strong and dangerous currents ripping against the rocks. Once you’re sucked in… you’re a goner. So stand at a distance when snapping that vacation pic and remember that mother nature can be a B*. Stickers: Check out the island and see if you can discover my stickers floating around on the most beloved spots! Also try and spot the scooters zooming in and out, some of them will be tagged. Did you spot one? Let me know by using the hashtag #HeHoLetsGo and share it on Social Media. 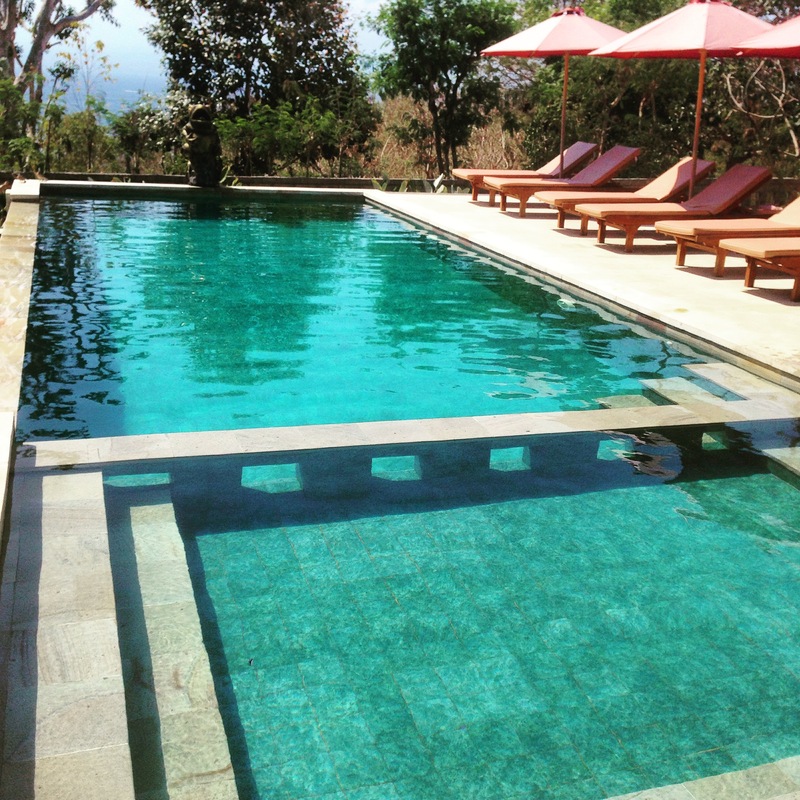 For tips on other places I’ve visited check my older posts such as: Ubud, Sidemen, Amed, Gili Air & more. Haha zo leuk jullie verhalen te lezen! 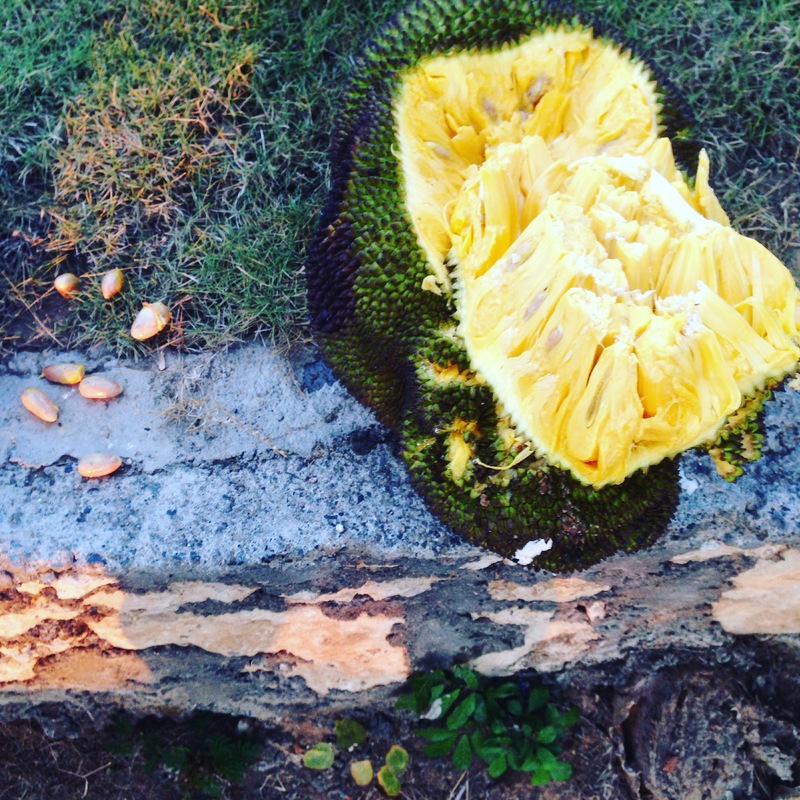 Dat jackfruit is apart he! Enjoy lovebirds. Haha Thanks darling! Ga sowieso een leuk article schrijven over onze gezamenlijk Vietnamese freundinnen ;), Keep you posted! Ohh wat ziet dat er toch allemaal mooi, exotisch en vooral heerlijk uit! Prachtige foto’s weer en heerlijk verhaal 👍. Het is alweer geweldig. En je kent zelfs de namen van de dieren al. Je weet natuurlijk dat je van dat mooie koraal en andere niets mag meenemen. Kost heel veel op Schiphol en je bent het ook nog kwijt!